From the sweet sounds of classical music to chilled-out beats and local folk bands, Whistler Olympic Plaza is the place for free outdoor concerts from May through September. Bring your picnic blanket and dancing shoes, and take free transit to the weekend concerts all summer long. Please check back for all summer 2019 concert dates and artists. Additional free concerts will be added as they are confirmed. Canadian musician Lights took to the stage at Whistler's Olympic Plaza, capping another summer of free music and good times in Whistler. 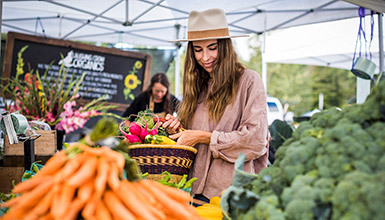 The Farmers' Market features local produce, live music, art and more. Held on Sundays in the Upper Village.